Storm Lake Iowa is a thriving small town with many cultures, a beautiful lake and parks, Buena Vista University, 2 marinas and a great place to call home. Storm Lakers love to have a fun! Lots of festivals, events, the Buena Vista University and the Beavers, a large destination hotel and water park - Kings Pointe, fishing, boating, diverse food, shopping, photography and camping can all be enjoyed in Storm Lake. Lots of things to get involved with on the Storm Lake United calendar, like the Star Spangles Spectacular, the Woods Wines and Blues festival, the Lose the Winter Blues Festival, Lake Fest, the Miracle on Lake Ave, and the Holiday Open House to name a few! See much more at Visit Storm Lake. Storm Lake is home to Buena Vista University a 4 year university located on a beautiful campus adjacent to the lake and a campus of the Iowa Central Community College. The Buena Vista Regional Medical Center is located in the heart of Storm Lake and has undergone extensive updating in the last 10 years. It was chosen as a Top Work Place by the Des Moines Register in 2016. 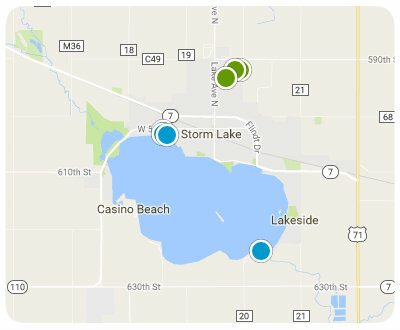 Want to dig a little deeper into Storm Lake, Check out our area facts.